For several years now I have had a small collection of masks, of differing origins, decorating one of my walls at home and I've had the good luck to have been able to keep these masks through several of life's little trials. If I was so inclined I'd believe that there was an ulterior reason for that. Ignoring what certain of the masks represent ( I'll look them up in due time) they all appeal to me otherwise they wouldn't be there but one mask in particular appeals to me. Applying the philosophy of a certain Bilbo Baggins (that if you step out of your front door always take a handkerchief with you, in other words be prepared for anything) I set out, on a virtual journey, in search of information concerning this strange elephant-headed mask really represented and in so doing opened a door to world of myths and legends beyond comparison. The more I read the more I was intrigued. Why is the elephant so important in certain cultures? Why did the little fellow have a broken tusk? Why would his father (Shiva) want to transform his son into an elephant? So many questions but fortunately I had taken my handkerchief and was prepared for the long road to knowledge and enlightenment. The following text is a limited synthesis covering just a few details about Ganesh, a full description would take up a whole encyclopaedia. There are several Puranas* concerning the birth of Lord Ganesh. In some, he is the manasika putra (mind-born son) of Lord Shiva. In others he is the creation of Parvati. 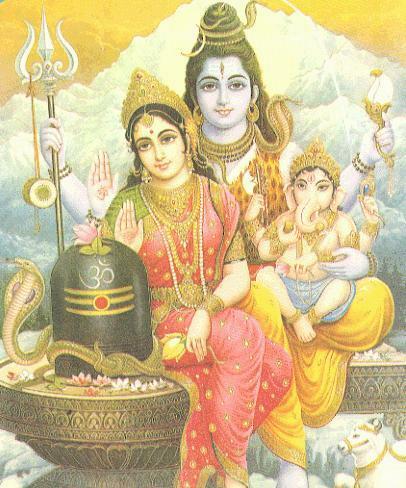 In still others he is the son of Shiva and Parvati. The most popular legend deals with the birth of Lord Ganesh to Parvati. Once while Parvati was going for her bath, she rubbed off the dust and oil from her body and out of it created the figure of a young boy. She infused life into the figure and told him he was her son and should guard the entrance when she went to bathe. Soon after, Shiva came to see Parvati but the young boy blocked his way and would not let him in. Shiva, unaware that this lad was his son, became furious and in great anger fought with the boy whose head got severed from his body in the ensuing battle. Parvati, returning from her bath, saw her headless son, and in aggrieved anguish threatened to destroy the heavens and earth. The gods and Shiva pacified her and the latter sent out his ganas, or hordes, to bring the head of the first living being with his head towards the north (the auspicious direction associated with wisdom). The first living creature they found sleeping with his head to the north was an elephant. They brought the head of this animal and Shiva placed it on the trunk of Parvati's son and breathed life into him. Parvati was overjoyed and embraced her son, the elephant-headed boy whom Shiva named Ganesh, the lord of his ganas. 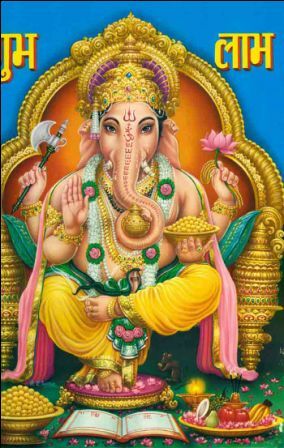 Ganapati or Genesha, the Lord of Categories: All that can be counted or comprehended is a category (gana). Ganesh is also the Lord of success and destroyer of evils and obstacles. He is worshipped as the god of education, knowledge, wisdom and wealth. Ganesh or Ganesha the Destroyer of Pride. Ganesha the destroyer of vanity, selfishness and pride. He is the personification of material universe in all its various magnificent manifestations and the beginner of things. Ganesh is also considered the deity for astrology and through him our minds become more aware and able to move onto higher levels of understanding. The broken tusk that Ganesha holds like a pen in his lower right hand is a symbol of sacrifice, which he broke for writing the Mahabharata*. As such Ganesh is considered the protector of scholars and writers. There are several legends as to the origin of Ganesh's broken tusk. One legend explains that Lord Ganesha broke one of his tusks to write the great epic, Mahabharata. Maharshi Vyas asked Ganesha to write the Mahabharata to his dictation. Ganesha agreed to do so on the condition that his pen would not stop writing till the work was concluded. Vyasa agreed but made another condition that Ganesha would write only after he completely understood what was narrated to him. Consequently, whenever Ganesha thought over some complicated verses, Vyasa took that time to compose further verses. Another legend explains how Ganesh, returning from a birthday feast, from Indra (god of the skies) had eaten so much that his mouse carrier Vahana stumbles and Ganesh fell off breaking one of his tusks. Ganesh is often depicted as mounted on a carrier, or vahana. This carrier is portrayed as a rodent but opinions differ as to whether the carrier is a mouse, a rat or a shrew. The reasons why Ganesh chose this particular vahana also differ. One reason is said to be that the rodent signifies the balance of all things. Another source explains that as the god of education Ganesh chose a rodent as his vahana so as to allow him to go into places no other (bigger) vahana could enter. Another explanation is that the rodent symbolizes the ability to move quickly and decisively.